The Kremlin is ours! The desperate and heroic struggle of our troops on the Moscow front has reaped its rewards today as our banners were unfurled over the once proud capital of the Bolsheviks hordes! Of course the soviet leaders including Joseph Stalin have long since fled like the cowardly dogs they are. Soon all of Moscow will be ours and the dawn of the 1000 year Reich will be plain for all to see! In other news troops of Army Group North have taken Kalinin and pushed 50 miles behind the enemy lines and in the northern arctic our hardy mountaineers have cut the only escape south for the defenders of Murmansk. This is truly an epic day for the Reich and testament to the faith of our glorious leader, Adolph Hitler, in the German people. Finland & Army Norway: German mountain troops concentrate and mount a risky low odds attack which retreats the soviet defenders and gains a foothold on the rail line just 30 miles south of Murmansk. In the south the Finns also try to break the deadlock by attacking the feared 10th Soviet Mech corp. A HX results in the corps’ destruction and lays this nemesis to rest. 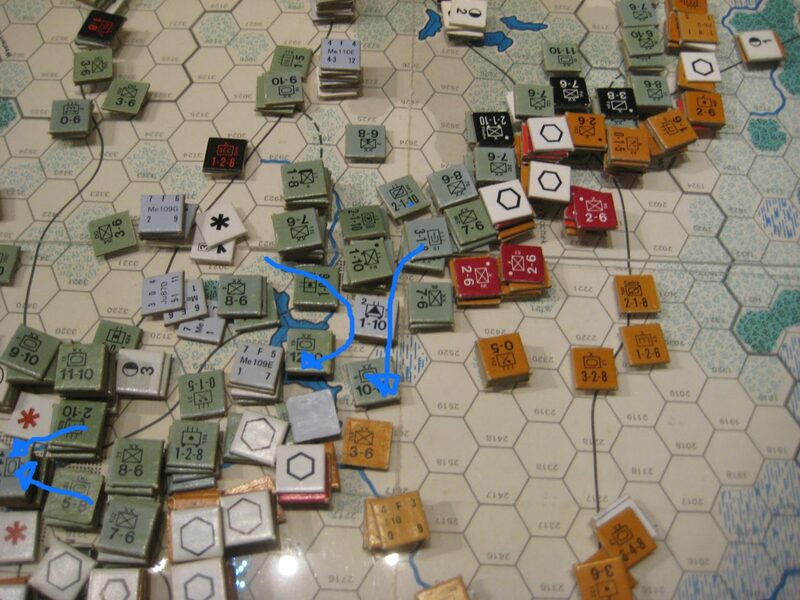 AGN: The attack on the battered and unsupplied defenders of Kalinin aided by the siege train from the earlier Kharkov assault smashes the defenders and the adjacent fort and rips a wide gap in the front. 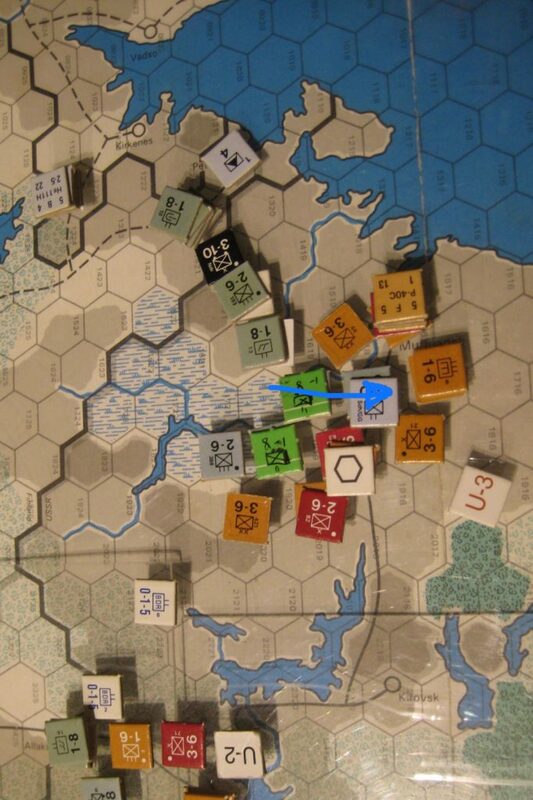 German armoured stacks exploit overrunning the weak defenders shielding the northern shores of the Volga lake system and push 3 hexes past the city. AGC: The German’s again attack the central Moscow Hex but this time have marshalled an assault stack of 30 points (after terrain adjustment) The defending NKVD troops convert the DR result to an EX but the Germans extract all losses from other attackers and the Assault stack overruns the two Soviet cadres and takes the central Moscow hex in the exploitation phase. The Axis stack surrounded just north of Tula breaks back to their own lines unaided and the breach is sealed by strong mech forces. 11th Army & the Crimea. No action this turn as the Axis forces await rail conversion and the destruction of the Soviet Fleet before any assault can begin. Air War: The Axis launch a number of offensive and defensive operations designed to isolate parts of the battlefield. The line to the north of Kalinin is cut in two places and harassment hits are placed to prevent troops moving in across land. 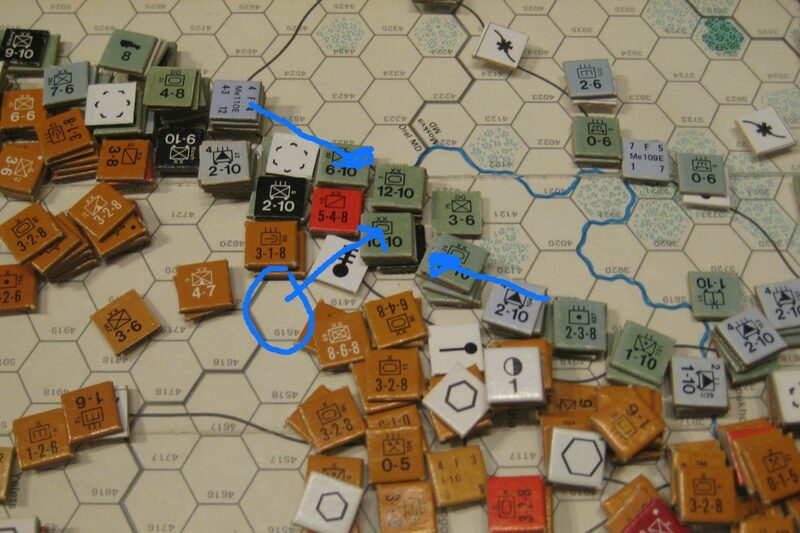 South of Leningrad however the results are less successful with no rail hit for a loss and an abort of two JU88As. Two swamp hexes are successfully harassed to limit Soviet infiltration. In the centre continued efforts are made to interdict the rail network supporting the Soviet advance but the proliferation of Soviet engineers in the area means this will be a slight hindrance at most. In the south despite earlier misgivings the Axis launch large raids against the Baltic fleet and successfully eliminate a heavy cruise and river flotilla supporting Sevastopol. At Odessa results are less successful with soviet fighters eliminating a Ju88a, aborting another and returning a third. One hit is scored against a heavy cruiser. Total Soviet fleet supply transport capacity is now less than the combined requirements for the front line troops at Odessa and Sevastopol.